This is the second installment in our new series which looks at former ARCA Racing Series Presented by RE/MAX & Menards competitors who've gone on to success in NASCAR. (3-16-10) - Racecar driver Justin Allgaier's nickname is "Little Gator," and it seems quite fitting, given the way he's chomped up records and championships on his way up the racing ladder. Now 24-years-old, Allgaier started racing quarter midgets at the tender age of five and moved into late models when he was 13. At age 14, Justin turned heads when he became the youngest-ever driver to advance to the A-Main race at the famed Chili Bowl midget event. Several years later, he would place third in the Chili Bowl A-Main, sharing the podium with NASCAR stars Tony Stewart and J.J. Yeley. When he was just 16-years-old, Allgaier made his first start in the ARCA Racing Series, an important springboard for young drivers hoping to make their way to the top levels of NASCAR. In three ARCA starts in 2002, driving a car owned by Ken Schrader, Justin had a solid 15th-place average finish. Allgaier would continue in the ARCA Racing Series for the next six years, going full-time in 2006, the year he posted his first ARCA win. That win came on the dirt track of the Illinois State Fairgrounds. He followed up with a second ARCA win in 2007 at Salem Speedway in Indiana. Justin finished 2006 rank 10th in ARCA points, and 2007 ranked fourth. The upward trend continued, as 2008 was a banner year for Justin in the ARCA Series. Competing against full-time drivers like Frank Kimmel, Scott Speed, and Ricky Stenhouse Jr., Allgaier won six of 21 races including three straight to end the season and was crowned the '08 ARCA Series Champion. In a total of 86 ARCA starts, Justin posted eight wins, 31 top-five and 45 top-10 finishes. He scored two poles and led a total of 755 laps. While making his mark in the ARCA Racing Series and a handful of starts in the NASCAR Camping World Truck Series, Allgaier caught the eye of Penske Racing and was quickly signed as a development driver for the renown racing organization. 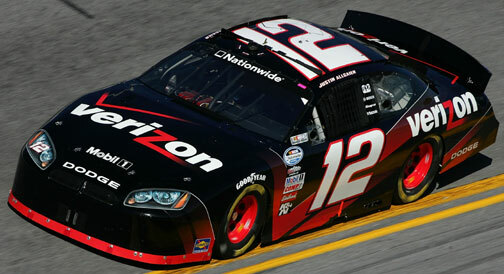 He ran the last four races of the 2008 NASCAR Nationwide Series in the No. 12 Penske Dodge with a best finish of 11th at Phoenix International Raceway. Last year, Allgaier continued to impress in his first full-time Nationwide season with Penske Racing, notching three top-five and 12 top-10 finishes along with a P1 start in Memphis. He finished the 2009 season ranked sixth in Nationwide Series points and was named the series' Raybestos Rookie of the Year. Currently, Allgaier is fourth in NNS points after three races, having posted three straight top-10 finishes to start the 2010 season. One of Allgaier's proudest moments came as a result of his association with the United States Air Force, a sponsor of his early ARCA race team. Justin and the team were recipients of the Air Force "American Spirit Award" in recognition of their patriotism and support of the military. Previous winners of the coveted award include Bob Hope, the St. Louis Cardinals, the Green Bay Packers, and Gateway International Raceway. Next Week: Ricky Stenhouse, Jr.